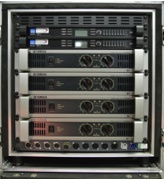 Light weight, power amplifier for touring sound applications. Includes onboard analog signal processing and a built-in network connection. 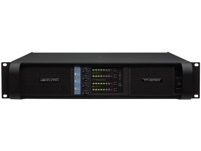 Class TD power amplifier with advanced load verification and monitoring. Utilises Lake processing and Dante networking. Class TD power amplifier with adjustable input gain and voltage peak limiter output protection. Versatile, economical power amplifier. Delivers high performance via Yamaha proprietory EEEngine. Light weight switch mode power supply, with class H amplifier engine. 4 x channel light weight switch mode power supply, with class D amplifier technology. Light weight switch mode power supply, with class H amplifier engine. 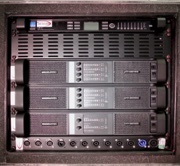 Fully configurable DSP loudspeaker proccesing section, configurable in real time via software and ethernet connection.